Do Ecovillagers Know How to Party? If you haven’t yet been to one of our holiday gatherings, here’s what we do: We eat, then we socialize, then we eat, then we plan, then we eat, then we sing, and then we end with some eating and some socializing. Yes, ecovillagers know how to party! But we also know how to generate enthusiasm for our vision of a better way to live on the earth. If you have friends or family members who have vaguely heard about our movement but are desiring more in the way of specifics, please invite them to join us on December 9. Our program for the afternoon will include a number of presentations that might inspire them to get involved. We’ll hear reports from representatives of the Hopewell Area Cohousing initiative (Mercer County) and the Altair Ecovillage group (Kimberton, PA). 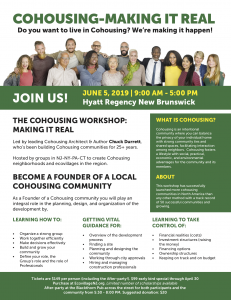 We’ll start to arrange carpools for our January 12th trip to visit the under-construction Rocky Corner community in Bethany, CT.
Mike Bellamy will share insights from Chuck Durrett’s intensive workshop at the Regional Cohousing Summit held in Amherst, MA in September. After the presentations and discussions (and a break for more eating) the fun will begin. Local recording artist Kyrie London will again grace our stage. And no one will be denied the opportunity to lead the assemblage in a song or toast of holiday cheer. It’ll be a pot luck as usual, so please bring a dish to share. ‘Tis the season to eco-celebrate. Hope to see you on December 9! RSVP here. This entry was posted in Agendas, Cohousing, Community, Ecovillage, Events, Organization. Bookmark the permalink.